I didn't get a chance to write about these movies when they were released this past summer so I'm taking this opportunity to briefly comment upon them before the deluge of Oscar titles arrives in my town. With the end of the year fast approaching you'll probably be hearing more about these titles through top-ten lists and Oscar nominations, so I'll waste no more time before throwing in my two cents about them. By now, Miyazaki may as well be Japanese for magic, for magic is exactly what his films generate, in their layered beauty and easy fantasy that are totally absorbing. 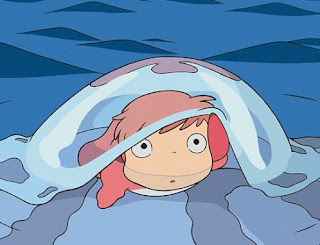 With Ponyo, Miyazaki has crafted another beautiful, fun, exciting, tender film. This time around, the plotting is so simple (it’s aimed at very young children) but the fantasy is so complex that there is a bit more of a wheeze to the exposition. But that’s almost secondary, and it doesn’t drastically distract, from the (typical for Miyazaki) effortless fluidity of the imagery positioned perfectly on the border between man and nature, real and unreal. The characters are adorable and the message is strong and sweet, making this perfect viewing for children and those charms aren’t lost on me either. There’s a magical trance-like quality to the exquisite minutia and vivid imagery that slowly draws me in. It’s confident, captivating filmmaking of the Miyazaki kind. 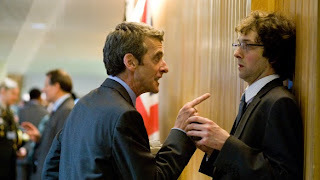 Armando Iannucci's In the Loop follows an eccentric ensemble of low-level political figures who may just decide to go to war if they ever stop endlessly circling the central debate with petty semantic parsing and furious flurries of insults, invective, and bile. It’s painfully familiar evil bureaucracy, but the movie is a non-stop laugh machine, sending wave after wave of quotable dialogue towards the audience in rapid-fire, profusely profane bouts of eloquent swearing. It’s not above a well-crafted sight gag either, like the sequence which follows a supposedly secret meeting that keeps growing in attendance, even after the committee switches to a larger room. The best of the consistently funny cast is Peter Capaldi as a spin doctor who storms through the movie insulting and complaining about anything that moves with the most creatively, wickedly hilarious vulgar metaphors I’ve ever heard. One of the most fascinating moments in the film arrives late in the plot when, in the U.N. meditation room, he stops talking and we get a chance to look at his face as he realizes, for the first and only time in the entire film, that he’s speechless, revealing most starkly that behind the flurry of words, there’s ultimately nothing. And that very nothing is what takes us to war. There is so much suspense in Kathryn Bigelow’s The Hurt Locker that the further it went on, the longer the tension mounted, the more my stomach twisted in knots. By the time the movie was barely half over, I was sick to my stomach. 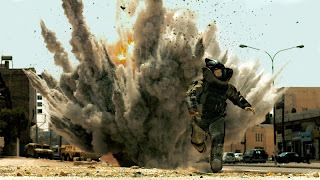 The movie is so completely immersed in the day-to-day work of an American bomb squad in Iraq, with great performances (especially by Jeremy Renner and Anthony Mackie, who are in almost every scene) and set-pieces all the way through, that it adds weight to the skillful summoning of sickening dread. It’s by turns unexpected, exciting, chaotic, scary, violent, and eerily beautiful. We are only given one sequence, late in the picture, with the luxury of being on the home front, away from the chaos of war, and it arrives with the force of a rug being pulled out from underneath you. The jump cut from the shimmering sands of the desert to the sterile, flickering fluorescent lights of a grocery store is as disorienting a cinematic moment as I’ve felt all year, one that helps the film say much more about the effect of war on soldiers than any Iraq War movie to date. 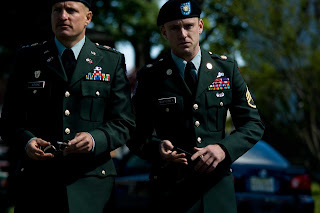 The debut feature from Israeli director Oren Moverman, The Messenger, is a well-written, exceedingly well-performed drama that follows two soldiers – a young man (Ben Foster) and a middle-aged vet (Woody Harrelson) – on assignment as the bearers of bad news to families whose loved ones have just been killed in action. The scenes that follow the men into the homes of the recently deceased to deliver the news are perfectly written and performed howls of pain. These are electrifying moments of human drama, of suspense and anguish, of deeply humanizing expression. But ultimately, the greatness of these scenes has a strange effect of making the film its own worst enemy. Outside of these perfect moments, the movie has a captivating, endlessly watchable nature, but it’s never as good as its own best moments. The story meanders a bit, fleshes out its lead characters and introduces new ones, including a widow played by the always perfect Samantha Morton, but the movie never quite adds up to a cumulative effect. Moverman directs with a clean, even-handed style that sits back and observes the characters as they go through their lives. This is a deeply political film, yet it is depoliticized. There is no heavy-handed moralizing or clunky speechifying. It’s simply and powerfully a look into the human cost of war. When the movie is at its best, it’s staring unblinkingly at the moments just before a family will be devastated by tragic circumstances and then keeps the cameras rolling as the reactions set in. 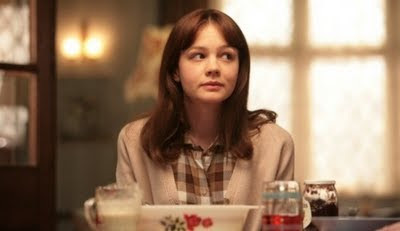 Carey Mulligan is almost unbelievably cute in the lead role of An Education, but that’s hardly the only good reason that so many critics and Oscar prognosticators have fallen in love with the film. On the one hand, it’s just a fairly routine coming-of-age story about a 16-year-old girl learning about life and love. On the other hand, it’s a very well done version of it. Mulligan, who I was surprised to learn is actually 24, plays the part with grace and charm and, in Jenny, she’s given a great character to play. She’s carefully poised with superficial depth and sophistication masking surprising emotional depth yet childishness. Mulligan’s also blessed with amazing support from an excellent cast that includes Peter Sarsgaard, Alfred Molina, Rosamund Pike, Dominic Cooper, Olivia Williams, and Emma Thompson, who all perform admirably. Sally Hawkins, so good in last year’s Happy-Go-Lucky, turns up for one scene that’s so emotionally involving, and well done, I wished she could have been given more to do. Director Lone Scherfig keeps the film moving at a brisk pace, hitting all the right notes with the help of frequently beautiful cinematography by John de Borman and a charming screenplay by Nick Hornby, capably adapted from Lynn Barber’s memoir. The early-60s time period is evoked with just-so production design which matches the matter-of fact charm that runs through the film. Likewise, the music is a mix of period songs and original songs that blend seamlessly with each other and with the nimble score. With all of this going for it, the movie should be really great, right? I wish. It’s almost there. In the end, the movie is a very enjoyable experience, light and fun with a handful of spiky dramatic moments, but it doesn’t stick. The movie’s impact seemed to be evaporating as I crossed the theater’s lobby, but, in the days since I have seen it, I’ve felt a growing desire to see it again. The movie’s impact might not be long-lasting, but it is still well worth feeling. THE GOODS. Not so much. 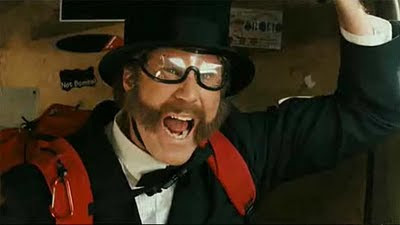 I had never realized how much I liked Will Ferrell until he showed up for one scene in the middle of The Goods: Live Hard, Sell Hard dressed as Abraham Lincoln while falling to his death in a tragic skydiving accident. As he plummets, he provides a running commentary that provoked the only smile to cross my face during the entire movie. That’s not to say it’s a particularly funny scene, but rather that Ferrell’s good-natured loopiness was a welcome respite to the mean, suffocatingly noxious humor provided by Jeremy Piven, dominating nearly every scene in the movie as Don “The Goods” Ready, a mercenary salesman who is hired to save a failing car dealership. Piven gives such a convincingly slimy performance as this cocky jerk that it coats the movie with unpleasantness and smarminess that would be less of a problem if the movie itself weren’t so persistently mean-spirited in its comedy and downright ugly in its visuals. It strands such likable actors as Ving Rhames, David Koechner, Kathryn Hahn, Ed Helms, Tony Hale, and James Brolin with embarrassingly unfunny things to do. This is a comedy that wields profanity and inanity as bludgeons in an attempt to beat laughter out of the audience. It’s just plain off-putting, ultimately giving cause for nothing more than 89 minutes of near constant, headache-inducing, brow-furrowing. Sure, Fantastic Mr. Fox is animated. Sure, it’s based on a book by Roald Dahl. But that doesn’t mean that it isn’t purely a Wes Anderson movie. 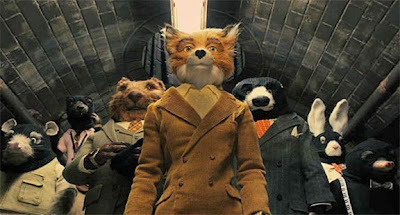 Mr. Fox (George Clooney) is the latest in what is becoming a long line of typical Wes Anderson protagonists, joining Dignan from Bottle Rocket, Max from Rushmore, Royal from The Royal Tenenbaums, and Zissou from The Life Aquatic as another man who exercises control over a family unit, but whose struggle to reconcile his incredible talents (or perceived talents) with his lifestyle brings his entire unit into crisis. If it sounds like Anderson (and co-writer Noah Baumbach) deviated from Dahl’s slim novel, it is because they did. This is as oddball a family film as Spike Jonze’s and Dave Egger’s Where the Wild Things Are and as distinctive in its visuals. Anderson has created a stop-motion dollhouse world of flat backgrounds and diorama-like sets that have tangibility and specificity in their exquisitely detailed bric-a-brac. Essentially, what Anderson and his team of animators have achieved is the perfect recreation of the Anderson aesthetic, or rather, through the complete control of animation, they have allowed it to be brought to its greatest realization yet. That the story itself, a wildlife-planned heist of sorts that pits forest critters against a trio of vindictive farmers, moves in an uneven pace with dialogue occasionally too precious (like using the word “cuss” as an all-purpose profanity stand-in) almost doesn’t matter. This is a movie worth seeing just to look at, not just in its auteur’s style and its excellent miniature set dressing, but in its incredible character design that makes the animals look like gorgeously designed toys ready to play with. Clive Owen is definitely a movie star. If you haven’t figured that out from his excellent performances and distinctive persona on display in films as varied as Children of Men, Sin City, Inside Man, The International, and Duplicity, you’ll discover it here in The Boys Are Back, not because this is a great movie, or even a good one, but because his mere presence illuminates an otherwise dull endeavor. It’s a based-on-a-true-story teary-eyed tale of a widower who has to juggle his sports-writer career with raising his two sons. That’s rich material and easily emotional, but that’s precisely why it fails. Director Scott Hicks, who has done excellent work in the past and will hopefully do so again, doesn’t strive to reach any emotion beyond that which is already hanging so low, the branch has snapped off of the tree. Every scene is slathered in sentimentality, though the shots themselves sometimes achieve a kind of beauty denied the film as a whole. The script, by Allan Cubitt, is merely competent. It’s a good thing then, that Owen, and the two young guys who play the sons (George MacKay and Nicholas McAnulty), are such sharp, appealing performers. Together they almost make the movie better than the script ultimately allows.